On December 5, 2017, a merlin, found in Ludlow, Mass, was admitted to the clinic with a left, mid-shaft open ulnar fracture. After giving supportive care with pain medication and antibiotics, the staff cleaned the wound site, applied a topical cream to the wound, and stabilized the fracture site with a wing bandage. After three weeks of treatment, the fracture site healed and the bandage was removed. Over the next month, the merlin was moved to progressively larger cages to allow more flight. The bird continued to improve and soon regained normal flight. 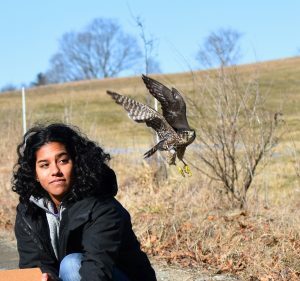 Tufts veterinary student, Nyasha Jawahir, is seen in the photo releasing the merlin on January 25, 2018. Merlins are small, energetic, and powerful falcons usually found near open forests, grasslands, and especially coastal areas looking for small birds or large insects to prey upon. If you have found orphaned, injured or sick wildlife, please take a few minutes to answer some questions so we can better guide you on what to do next.